The Holy Year of Mercy comes to us as a gift from God through the ministry of our beloved Pope Francis, and as Saint Paul once said: “Behold, now is the acceptable time, behold, now is the day of salvation” (2 Cor 6:2). We have been called by Pope Francis to celebrate this Jubilee Year, first of all, contemplating the face of Christ, in whom the mystery of God’s mercy has reached its summit. But we also need to bring the experience of God’s mercy to the whole world. Our Diocese is fully embracing this joyful celebration with many different programs and events, but, above all, by promoting the Spiritual and Corporal Works of Mercy. 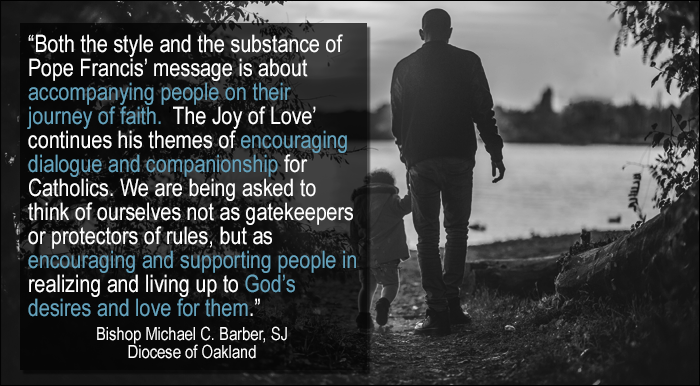 It is my deepest desire, as father and pastor of the Church of Oakland, that each Catholic might be willing and able to practice them and truly become “merciful like the Father,” not only during this Holy Year, but always. Amoris Laetitia | "The Joy of Love"
"Let the Church always be a place of mercy and hope, where everyone is welcomed, loved and forgiven." Pope Francis. I came not to call the righteous, but sinners’ (Mk 2:17). Please pray for the people of Pelgium. May God bring them consolations. Jesus answered, ‘I say to you, not seven times but seventy-seven times.’” (Matthew 18:21-22). Know that the Lord, your God who keeps covenant mercy to the thousandth generation toward those who love him keep his commandments. Simeon found peace in the mere sight of the infant Jesus. Where do you experience the peace of Christ? "Rachel" still weeps for our world filled with innocent victims of hatred and violence. How can we be attentive to their cries? Lord, help me to throw open the hidden places of my soul to receive the fullness of your love and mercy. The promised triumph of Christ’s love enfolds everything in the Father’s mercy. - Pope Francis.